As you’ve seen, Mobiscroll 2.1 arrived a while back with some awesome new features. We’re supporting several languages. 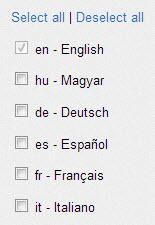 At this point you can add English, Hungarian, German, Spanish, French and Italian to your download. If you’d like us to add another language, you’re welcome to send us the translation. For more info on how write language modules visit the docs. It’s easier than ever to use mobiscroll if you’re developing with jQuery Mobile. Initialization with data-attributes = AWESOME. This will get rid of the pain of setting up mobiscroll instances. Thanks dahool for the initial version. We’re in the process of migrating issue tracking and all the background development (that is just easier for us) to Github. So all issues (which are still valid) from Google Code will be moved over. If you’re experiencing problems, spot bugs this is the place to post them. Everybody is invited to join us on Github. We’re introducing support packages. This is targeted to those developers and companies that have built mobiscroll into their products or are using it for building software for their clients. We know that you need to concentrate on the essentials of your business and product, and don’t want to spend valuable time on fixing mobiscroll bugs. With a support subscription you ensure that you’ll get the best help when you need it. A bug is holding you off? Get patches with fixes before official releases. We’re constantly building new features and are improving the controls with every release. We’ll guide you through the upgrade process making it painless. If you subscribe to support, we’ll throw in the Rating Scroller for FREE. Make it easy for your users to rate and grade your items, products and services. For more info and to subscribe follow this link. We love StackOverflow and we know you love it too. If you have questions for the community or would like to help out search for the “mobiscroll” tag and ask/answer. There are a ton of things we have planned for the future. We’ve been working on new features, fixing bugs, and we want to make it easier for you, the developer, to provide an awesome experience for your users (and WOW your project manager and clients). Since Windows 8 got released we hope to confirm full WP8 phone and tablet support. If you’re in possession of such devices, giving us some feedback would be appreciated. IE10 Show/Hide Animations will be included in the next release, and a Windows Phone skin is in the works. You can’t imagine how excited we are about this. For the background about mobiscroll + Windows Phone follow link. We are interested to know how you’re using our UI components. Tell us the story on how mobiscroll makes your life as a developer easier.